European leaders have voiced concern over growing anti-Semitism across Europe following a series of attacks on Jewish people and property. 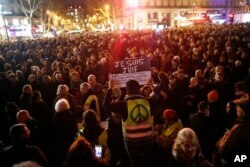 Rallies were held in cities across France Tuesday to show solidarity with Jewish communities and demand an end to growing anti-Semitic rhetoric among some politicians and extremist groups. Among those attending was rabbi and author Delphine Horvilleur. "At this moment, at the Place de la Republique, these generations are holding hands to say together 'No to anti-Semitism', 'no to hate'," Horvilleur said. French President Emmanuel Macron visited a Jewish graveyard in eastern France that had been vandalized earlier Tuesday, the latest in a series of such attacks that are driving deep concern across the continent. "A group of hateful individuals committed what others, sadly, have committed in the past for too many years," Macron said. The solidarity demonstrations were called in response to an incident Saturday in Paris, when Jewish writer Alain Finkielkraut was targeted outside his home by so-called yellow vest protesters shouting "dirty Jew and bloody Zionist." 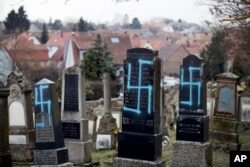 The rise in attacks and anti-Semitic rhetoric has prompted some Jews to question their future living in Europe. It was the subject of a debate at the Munich Security Conference in Germany Sunday, under the provocative title, Should Jews stay or leave Europe? Professor Michel Friedman, former president of the European Jewish Congress, said he was finding it difficult to answer that question. "I believe that we are not on the peak of anti-Semitic movements in the world. We are perhaps even just starting," he said. Friedman traces a mainstream political acceptance of such views to Austria in the year 2000, when the center-right People's Party agreed to enter a coalition government with the extreme-right leader Joerg Haider's Freedom Party. "We thought at the time that this would be a moment of misunderstanding, one and never again. Today it is common. The AfD in Germany is elected. They want to re-write history, they are clearly anti-Semitic and they are racist. But we have this in France with Le Pen, we have governments in Hungary, we have governments in Poland, we have governments in Italy. It's not only an eastern European problem," Friedman said. Those parties deny they are anti-Semitic. It is to eastern Europe that Israeli Prime Minister Benjamin Netanyahu has looked to for international support. Critics say he has willingly overlooked growing anti-Semitism in the region, such as the vilification of U.S.-based Jewish financier George Soros. "The fact that Israel is running a friendly relationship between itself and countries in eastern Europe should not undermine the clear message coming from Israel saying we do not accept that. Even if these countries are friendly towards Israel," prominent Israeli author and journalist Ronen Bergman told the panel in Munich. French President Emmanuel Macron places a pebble on a vandalized tomb to a pay a tribute during a visit at a desecrated Jewish cemetery in Quatzenheim, France, Feb. 19, 2019. Also at the debate was U.S. Democratic Party Congressman Tom Malinowski, who said anti-Semitism is a growing problem in the United States. "Something is giving people with that mindset the feeling that they now have the permission to express their views." They are views being expressed through violence, vandalism and abuse that are forcing Jews to question their very future in Europe.